1 Blemished Available: $449.96 This item is available as a Blem/Refurb. These are items that cannot be sold as "New" merchandise and are limited to stock on hand. See the product details for a description of the product's condition. I purchased these after returning the SIDI ADV2's. They are way more protective and way better built. The soles are stitched on unlike the SIDI's. They are more stiff but I'll trade that for the added protection they offer and the better construction. The buckles are far superior than the SIDI's as well. Happy! These were the only boots that I found fit my wide feet ( I am a women's size 8-8 1/2 d width, aka wide feet!). There was some room in the heel, but I put in some green superfeet sole. Between the superfeet and the very adjustable buckle across the ankle, the boots fit great! My bike pants are a tight fit over the top part, and I have to keep the size zipper of my pants a bit unzipped, but no matter, as the boots are Gortex! 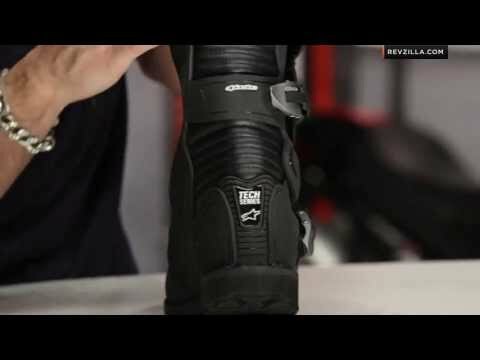 Thank-you to the RevZilla team for helping me to find these boots! I called and received excellent guidance! I had a hard time choosing between these Tucan boots and the Corozal boots. They are very similar boots. I picked these over the Corozal because they are slightly wider and they have a tiny little vent. I have ridden about 1,500 miles in these boots in rain, cold and heat. They are great in the cold. They are great in the rain as long as I am wearing waterproof pants. This weekend I wore them in the heat and my socks got soaked with sweat. That little vent does nothing! There is NO airflow. Then we got caught in the rain, which soaked right through my mesh pants and ran down my legs and filled my boots. I was impressed that they only took 2 days to dry instead of 3 days, like my previous pair of boots. I am very happy with these boots. I dropped the bike on my foot and the boots protected me. I could have had a broken foot, but instead I was only sore for one day. These boots are comfy to ride all day in, and comfy to walk around in too. I wore these on a 3-week, 4500mile on/offroad riding trip on my BMW GSA. During the trip I rode in everything from 95 degree desert heat to 20 degree snowstorms. These boots are fantastic, regardless of the temperature. The one criticism that I have is that the stock insoles are garbage -- one actually almost worked itself out of the boot up the back of my calf. Swapped in a set of Supereet Green insoles and they're the best ADV boots I've ridden in. First-sizing- i wear a 10, and the 10 was an excellent fit. Room in the toe and comfortable all around. Wore them in 40 degrees with normal MX socks. Plenty warm. Multiple water hole crossings and heavy splashings and no wet feet. Even did the bath tub test. Halfway up the boot and no leaks. Protection is reduced but still a solid boot for offroad. Ankle protection is very adequate for enduro/trail riding. Sole is much better than a typical MX boot. Each boot weighed on a Fed Ex. Scale. 3 lbs. Feel lighter, and easy to walk in. 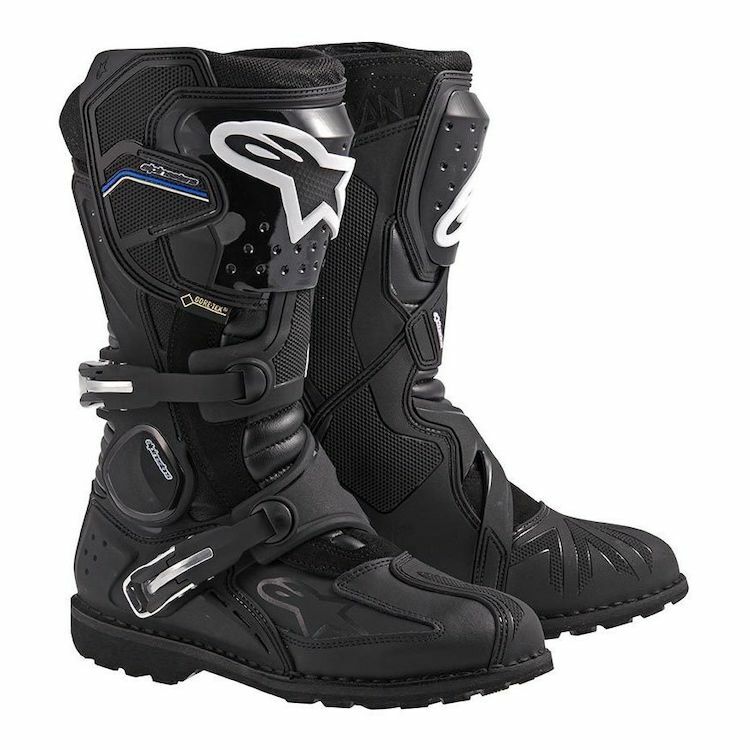 Boots are about 2" shorter than most MX boots, and the waterproof gaiter only comes just over halfway up the shaft. Dont understand why this is common in off-road boots. Second-Price. This is about a $350 boot. Not $500. Well made but still overpriced. Buy it on sale if you can, but Im very pleased overall. I've worn these boots for about 3 years now and ride my bike on an almost daily basis to work and to take on some camping adventures on occasion. The boots look almost like new. I ride a KTM 990. These boots are comfortable when riding and walking around, like at the grocery store. I did hurt my ankle pretty bad when I crashed my bike riding off road and my leg got caught up with my bike. I was disappointed that these boots didnt provide better ankle protection, but I bet my ankle would have been really messed up had I not been wearing them, and they were faced with a 500+ lb adventure bike. I wanted good protection, stability and bombproof waterproofing. 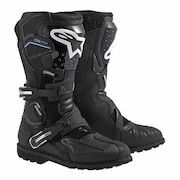 I tried the SIDI Adventure 2 boots but they had very little padding and hurt my ankle bones. I had a 10 year old pair of Alpinestars Gore-Tex street boots which remain my most comfortable shoes I own. I decided to stick with the Alpenstars line and go for the Toucans. My old boots were a 42 and I fit an 8.5 shoe. I had the choice between 8 (42) or 9. I got both and found the 9 to be huge so I kept the 8. These boots (like my old ones) were comfortable from the first moment I put them on. They are super easy to take on and off. The buckles are so awesome they are magical. No amount of dirt slows them down and they close well every time. The upper buckle seems to flex a bit upward (it is at the limit of the swivel) but it does not bother me. Seattle rain & every puddle I can find have shown the Gore-Tex to be doing its job well. I wish they did not have the dramatic white branding at the top. I generally hate that. I am able to (just barely) get my pants over the boots so it is really a non-issue. They are a bit thick in the toe and it is a bit difficult to shift. I am going to have to work on changing or moving the shift lever in order to reliably get my toe under. They are an expensive boot but if they last like my old ones it will be money well spent. Sturdy high quality boot. You have to ask your self, how much dirt riding will I do? Beacuse the is almost as beefy and sturdy as a Motocross boot. They do not flex much and the chinprotection are hard to get under your pants. If I as a 20/80 on-off roader have to choose again I think I will go to a less extreme alternative such the TCX adventure boot. But the Alpinestars look cool and are very good offroad. They work for on road use but they are a little bit to stiff and make gear shifting hard. Sum up: High quality boot for 30/70 on/offroad use. Nice boots but the left toe is so tall that I occasionally miss shifts and after aggressive riding the insert in the left boot ends up wrapped around my heel . I have tightened the ankle clamps but while walking they always loosen. I would return these boots but I didn't know there were problems until I had worn them for a while.